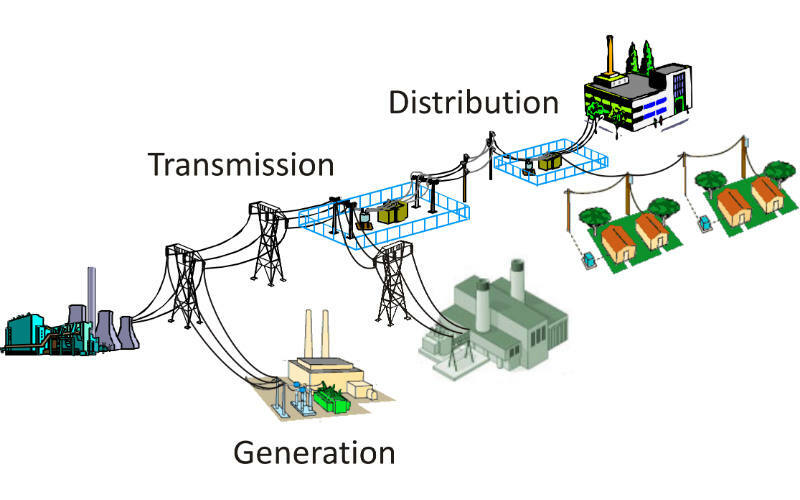 In this article we will study about Distribution power generation . we will discuss in detail about the distribution power generation and also studied about advantages of DG system. we will know their introduction and function. Electricity demand is growing in all the countries of the world. The electric utility installed capacity in the world, at present, is about 3100000 MW and to meet the increasing demand about 80000 MW of new capacity has to be added every year. In USA the utility capacity is about 850 GW AND AN AVERAGE OF 15000 MW of new installed capacity is needed every year meet the increase in demand as well as to replace about 6000 MW of old plants which are require to be retired every year. In India the utility installed capacity is about 118 GW at present and is expected to increase by at least 5% every year in the coming years. The situation in many other countries is almost similar. Another phenomenon taking place everywhere is power system deregulation and opening up of competition. This system is likely to compel the generating companies to setup small generating plants close to the customers. This system of generating is called decentralized or distributes power generation (DG). The significant applications of DG system include back up (stand by) generation utility grid enhancement, peak shaving, load management etc. it has been estimate that DG, in the world, would be about 20% in near future. To summarize the above advantage tend towards evolution of a new modernized electric power system greater flexibility and security. 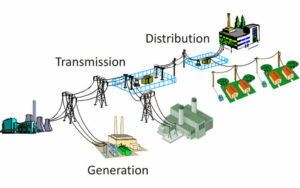 Indicates the various distributed generation energy sources. These can be classified into conventional sources. These can be classified into conventional and non-conventional. The conventional sources include combustion turbines, reciprocating engines, micro turbines and fuel cells. Natural gas and petroleum are used for these forms of distributed generation. However there is growing trend towards using non-conventional sources. This is, evidently, due to the fact that natural gas and petroleum sources are fast depleting and also due to growing environmental concerns. Biomass, solar and wind energy distributed generation system are being increasingly added to the grids and these trends will continue in future. The non-conventional energy sources have the disadvantage of high investment cost. A significant part of this investment cost is the cost of power electronic interface. The output voltage of a distributed generation system may be dc (in case of photovoltaic system and fuel cells) or ac (in case of wind energy system). However, it is mostly a variable voltage and has to be made compatible with grid voltage. Therefore a power electronic interface is always needed between distributed generation system and grid. (1) Power conversion from a variable dc (or ac) voltage compatible with grid voltage and frequency. Moreover the output voltage of distributed generation may be more or less than grid voltage. (2) Output power quality assurance with total harmonic distortion (THD), low voltage and frequency deviation and low flickering. (3) Protection of distributed generation system and electrical power systems, from abnormal voltage, current, frequency and temperature condition with additional function as anti-islanding protection and electrical isolation etc. (4) Control of distributed generation system coupled with objectives like maximum power point tracking of PV array, maximum power extraction from wind energy system, optimum efficiency of fuel cell system etc. When light radiation falls on a p-n junction, a voltage is generation. The primary power comes from the striking photons. The use of solar insolation to generate electricity is increasing constantly over the past few years. As the world‘s electricity demand is increasing the use of photovoltaic system connected to the utility grid are attracting more and more attention of power planners. As the costs of PV modules and power electronic interface are showing declining trends, PV system are likely to play major roles in supplying the future electricity demands of the world. PV system is an all electrical system and has no moving parts. Life time of PV modules can be 25 years or more. However the power generation capacity gets reduced drastically due to ageing. Many photo voltaic technologies exist. Constant research and development activities are going on to reduce the cost of photo voltaic. When photo-voltaic cells are connected in series we get a reasonably high voltage (about 40 V or so). However the weakest among these cells determines the current rating. Many series strings are connected in parallel to increase the current rating. 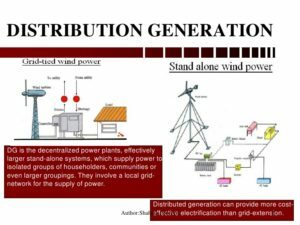 Hence these are Distribution Power Generation System . If you will find any incorrect in above article you must comment below in comment box. If you want to know more about the Distribution power Generation you must sea this video.